In a small bowl, whisk together the flour, salt, and baking soda. Set aside. Place the butter in a large bowl and use a hand mixer at medium-high speed to beat it until light and fluffy. Add the brown sugar and sugar, and mix for two more minutes, until the mixture is smooth and combined. Add the egg and vanilla and mix another minute. Add the tahini and mix until combined. Add the dry ingredients and mix on low speed until just combined. Stir in the chocolate by hand with a rubber spatula. Form the dough into a ball, wrap it in plastic wrap, and refrigerate it for at least 2 hours or up to 24. Preheat the oven to 350°F and line two cookie sheets with parchment paper. Bring the dough out of the refrigerator and unwrap it. Cut the dough using a bench scraper or knife into 12 equal pieces. Form each piece into a ball, and place six balls on each prepared baking sheet, leaving space between them. Bake for 10-12 minutes, until the edges of the cookies are just turning brown. 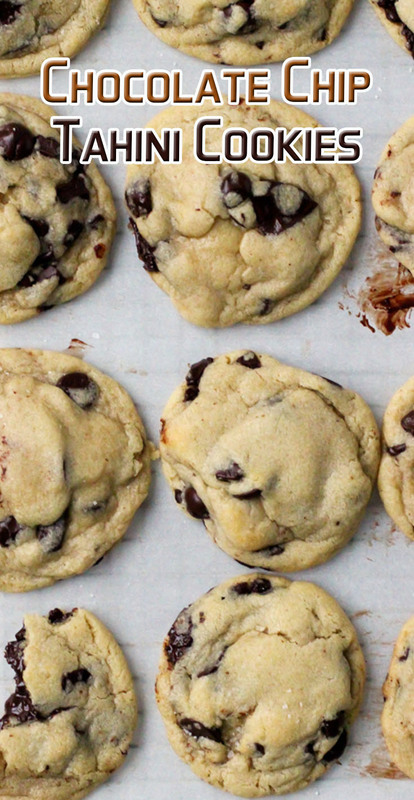 Allow to cool on the cookie sheets for a minute or two before eating.